It’s always important to remember that Apple is masterful not just at designing and manufacturing products, but also marketing and selling them. Even though Apple sticks to a fairly predictable release schedule throughout the year, it can still surprise. At a media event last week, it unveiled new iPad Pro models and a second-generation Apple Pencil to work with them. They look impressive, incorporating many technologies from the iPhone X and iPhone XS such as Face ID, a swipe interface that replaces the home button, and expected performance improvements. But the surprises appeared during the Mac portion of the event. There was no mention of the new Mac Pro in development, teased last year at this time, and no updates to the iMac, iMac Pro, MacBook or MacBook Pro. What’s left? The Mac mini and the MacBook Air, two products that seemed destined to be written off the board any day now. The Mac mini is a long overdue upgrade to Apple’s tiniest Mac, incorporating a faster processor, memory and SSD storage, plus Thunderbolt 3 (USB-C) connections. It starts at $799, and is a fine choice for people who want a desktop Mac that isn’t the all-in-one iMac. The MacBook Air, however, is a curious addition. I keep thinking of this quip when I look at the new MacBook Air. Why did Apple update it after essentially ignoring it for so long? The last major update was in 2015, with a slight specifications bump in June 2017. 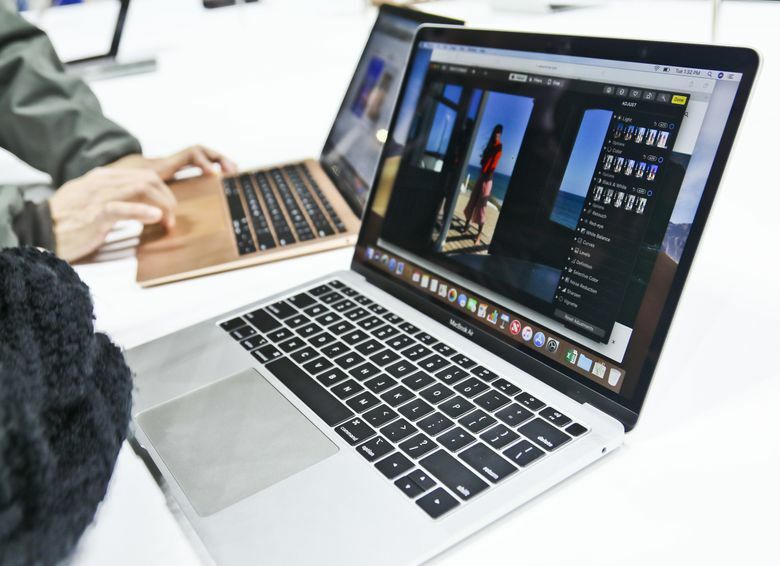 Since the introduction of MacBook Pro models with Retina-resolution screens, MacBook Air fans have wanted the same display in the smaller Air form factor. Instead of delivering that, though, Apple introduced the modern MacBook in 2015, an even-slimmer laptop with a Retina screen—and a single USB-C port. It was relatively expensive and underpowered, but it fit that niche for people who wanted the most portable Mac. The MacBook Air hung on in the lineup, remaining the most affordable Mac laptop (hello, college students!). But like the Mac mini (and Mac Pro), the Air seemed abandoned. And why not? Apple is moving steadily to Thunderbolt 3 as its connector of choice on its products — the new iPad Pro now has a USB-C connector, not a Lightning port—and the MacBook proved that the company can pack a fair amount of power and a lot of battery capacity into a small space. The MacBook was the future. And yet here’s a new iPad Air. It has a 13.3-inch Retina display with a native resolution of 2560 by 1600 at 227 pixels per inch. The processor is an eighth-generation Intel Core i5 model at 1.6 GHz, with Turbo Boost up to 3.6 GHz and 4 MB of L3 cache. Storage starts at a paltry 128 GB, but can be upgraded at purchase to 256 GB, 512 GB, or 1.5 TB; all of those are fast SSDs, which is good for performance. The graphics processor is still integrated with the processor, this time an Intel UHD Graphics 617 chip. And the memory starts at 8 GB, but can be upgraded (again, at purchase) to 16 GB of 2133 MHz RAM. The MacBook Air has two Thunderbolt 3 ports, bypassing the annoyance of the MacBook when it comes to choosing between charging or using peripherals (or buying a dock that can handle both). Also worth mentioning is the inclusion of a Touch ID sensor, which is powered by an Apple T2 security chip with a Secure Enclave (which stores fingerprint and Apple Pay data in a way that can’t be accessed, even by Apple). Touch ID on a laptop is fantastic — I use it all the time on my MacBook Pro when opening 1Password without having to type my password every time, for example. Pricing starts at $1,199. And there’s another noteworthy item: The aluminum used to make the new MacBook Air case, which is machined from a solid block, is now entirely recycled material. The Mac mini’s enclosure is also made of recycled aluminum. All that said, we go back to the question: Why MacBook Air? Apple could have easily incorporated two Thunderbolt ports, increased the processors and storage, and introduced it as the next iteration of ultra-portable Macs. (Assuming all of that would fit within the thermal constraints of the MacBook design.) The MacBook Air could have drifted off into the sunset, perhaps with a single-port MacBook model replacing it as the entry-level Mac. It’s always important to remember that Apple is masterful not just at designing and manufacturing products, but also marketing and selling them. And the MacBook has a perception problem. It’s seen as a limited, underpowered secondary device, and has an air of “experimental product” attached to it. It’s for the person who doesn’t mind paying a bit more for ultra-sleek design and wants exceptional battery life, not necessarily an all-around Mac. The MacBook Air, however, is one of Apple’s all-time best-selling Macs. It has caché and years of built up goodwill. Apple gets to extend that goodwill with a new model that has the features Air users have wanted for years. People for whom the MacBook Air was their first Mac (hello, college students who are now in the workforce!) know and love their Airs. That also allows Apple to keep the svelte MacBook in the lineup to appeal to its audience. And, to be honest, Apple can keep experimenting with it while still selling MacBook Air units in bulk. Because if there’s one thing Apple knows how to do, it’s sell hardware.